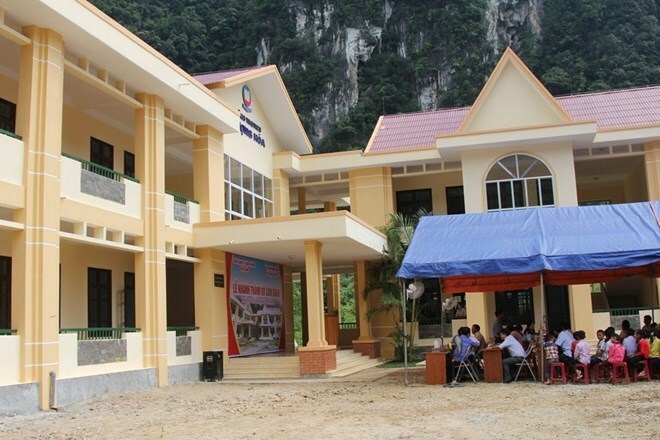 Hanoi (VNA) – The national flag carrier Vietnam Airlines (VA) on August 19 inaugurated a new school for pupils in the mountainous commune of Thuong Hoa, Minh Hoa district, the central province of Quang Binh. The Thuong Hoa elementary and secondary school was built at a total cost of nearly 5 billion VND. The handover of the school was concurrent with the new academic year 2017-2018 and the 72nd anniversary of August Revolution (August 19) and National Day (September 2). The school has two-storey buildings, including four classrooms, two functional rooms, two housing areas for teachers and supporting facilities. Pham Ngoc Vui, Chairman of the VA Labour Union, said it is the last of seven social welfare works worth 35 billion VND (1.52 million USD) in total funded by the carrier under the government’s Programme 30A on supporting rapid and sustainable poverty reduction in 61 poor districts. The school was founded in 1963 to train more than 400 ethnic students in the locality. However, due to limited local budget, its poor infrastructure impacted teaching and learning quality.